The purpose of your education is to prepare you to serve the communities in which you find your self throughout your life. Service to the community can be done in many ways. We want to prepare you to make a lasting difference in the lives of others, so we offer opportunities for you to develop and grow your skills in four different arenas, each connected to the others. We ask that you do one or more of these programs to develop your skills to serve the world. The world needs more Saints. The world needs you. 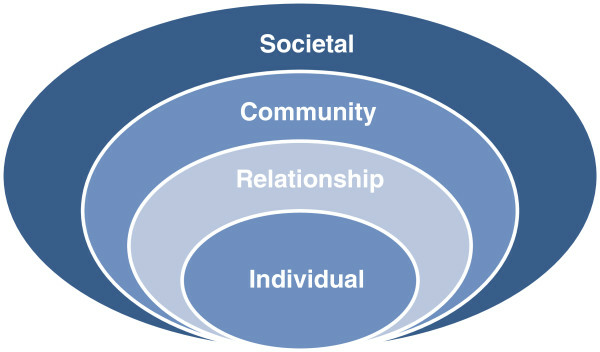 The Saints Leadership Program has four tracks, based on the socio-ecological model for change. Each track can be taken individually and three of them can stand alone. If a student successfully completes all the tracks by April 1, prior to their graduation, they will be able to graduate with Saints Leadership Honors. Developing Authentic Leadership Track (Individual): Through five online modules, students will reflect upon their own strengths and skills as a ground from which to develop their leadership. This online program, designed by CSS Management and Organizational Leadership professor, Dr. Lynn Kalnbach, is available to all CSS students using their CSS email account. It can be completed at any time during your CSS career. This program includes: Part I: Values in Action, Part II: Leadership Story, Part III: Leadership Skills, Part IV: Dimensions of Leadership, Part V: Workplace Resilience . Sign up and start now! Or you can go to http://resources.css.edu/alp/ learn more about this program. Developing Interpersonal Leadership Track (Relationship): This program focuses on developing the personal and interpersonal skills for healthy and effective leadership. This is open to any student who has been an undergrad student at CSS for at least 9 months. It is an in-person program offered on the CSS Duluth campus. Get signed up by attending! Violence Prevention and Primary Prevention Track (Party Revolutionaries/BEST Party Model) (Community): This in-person program is offered on the CSS Duluth campus and is facilitated by our community partner Men As Peacemakers and CSS Violence Intervention and Prevention. By using the lens and theory of primary prevention of sexual violence prevention, students learn how to think proactively about designing spaces and cultures to create the kinds of communities and outcomes they desire. This track can be completed during any semester of your CSS career. During SPRING 2019, BEST Party Model will be on Thursday evenings starting on Thursday, February 21st from 6 - 7:30 pm in Tower 3147. There are 9 sessions for the program. Sean Elmquist from Men as Peacemakers is the lead facilitator. Sign up to get leadership credit! Community Impact and Systemic Change Leadership Capstone (Societal): Funded in part by a generous grant supporting sustainability from the Margaret A. Cargill Philanthropies, this program will look at policies, laws, and their impacts on communities. The focus of this track is developing understanding of systemic impact and the skills to create change. Students must have completed at least two of the other tracks prior to enrolling this this program. The dates are listed below. is open to all students in their second year of college or later. The program includes six workshops offered on Sunday afternoons for 1.5 hours throughout the year. Students may come to any and all workshops. To earn the Saints Leadership Certificate, students must attend and participate in five of the Saints Leadership Workshops and complete a reflection on of the five workshops attended within the time period assigned(see below). The Certificate Ceremony will be at 5:00 on Sunday, April 7 for those who have completed the program. All students can come to any or all of the workshops. However, if you attend 5 of the 6 Saints workshops and complete a reflection form on each of the workshops, you will receive a Saints Leadership Certificate and will be able to put on your resume that you successfully completed the CSS Saints Leadership: Interpersonal Leadership Track. Burns Wellness Center--Cookies and lemonade will be served! With experiences in and out of the classroom, sophomores understand that the way they perceive and make decisions about the world around them may be different than others. In this workshop, sophomores with work with Mary Anderson and Carrier Tayler Kemp from Career Services, in developing an understanding of personal talents, and then explore ways to develop these talents into strengths. This workshop will be foundational for the other workshops in the Saints Leadership series and participants will be able to use this common language and understanding of strengths in future workshops. Sophomores can specifically use this knowledge to help as they move into leadership roles and prepare for other experiential learning opportunities. Identify and describe top five personal strengths. Know the impact strengths may have in your individual and group interactions. Understand ways to effectively lead with your strengths. Develop action steps to apply strengths to career, academics, relationships and leadership. Burns Wellness Center 249--Cookies and lemonade will be served! Sophomores have experience living with people who are not members of their family, but now they are more independent in their apartment living situations. This workshop will help students to identify, early in the process, the moments where conflict begins and relationships start to break down. Practicing these skills with roommates and during group work will create opportunities to understand how conflict unfolds and develop strategies and skills needed for successful team leadership, group work, successful employment and community relationships. Through the lens of alcohol misuse/abuse and sexual and relationship violence, this workshop will help sophomores in the next level of identifying problematic behaviors and triggers. Through guided self-reflection, students will gain tools for helping and supporting themselves and others though difficult and often emotionally complicated events and affairs. Now that you are a sophomore, you are probably feeling a bit more comfortable with the CSS environment and are ready to step more outside of your comfort zone. You are likely starting to have hard conversations with friends and roommates and finding that you do not always agree on things. How can you practice having those conversations and maintain your relationships? That could mean attending various student organizations (maybe CJL groups), volunteering, and having in-depth conversations about racism and other topics around social justice and diversity. In this workshop, we will help you to engage in hard conversations about big issues while focusing on building authentic relationships, respecting different experiences, learning and practicing how to listen. SaintsStepIn: Bringing it All Together! You are a leader, with your own set of strengths. You can (and do!) impact campus culture. How will you step in? How will you step into relationships, situations, systems, and conflicts to impact the world for good? Workshop participants will tie together the themes of the different workshops in this series to develop tools, skills, and an ability to practice preventing and intervening on issues of hurt and harm that impact our community and neighbors. Build on their skills, strengths, and ability to identify issues of hurt and harm. develop tools and skills to intervene on issues of hurt and harm building off their strengths and values. This in-person program is offered on the CSS Duluth campus and is facilitated by our community partner Men As Peacemakers and CSS Violence Intervention and Prevention. Men As Peacemakers has worked with students to create the BEST Party Model --an innovative approach to sexual assault prevention on college campuses. BEST involves college men and women in shaping safe, respectful, and fun party environments that will help prevent sexual violence. This is an 9-week course that covers topics from environment shaping to bystander intervention. By using the lens and theory of primary prevention of sexual violence prevention, students learn how to think proactively about designing spaces and cultures to create the kinds of communities and outcomes they desire. This track can be completed during any semester of your CSS career. If you have COMPLETED two of the other tracks by Feb 23, you can start this program. Please see www.css.edu/saintsleadership for information about the other tracks. And please note that in order to qualify for Leadership Honors at graduation, you must have successfully completed ALL the tracks. The CSS Student Senate hosted the first Saints Leadership Summit on October 22 and 23, 2018. 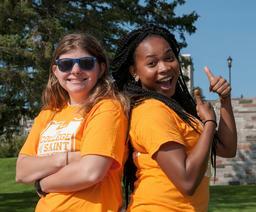 The event was open to the student body and the Senate invited students from other Twin Ports colleges. While this event is not a "track" for Saints Leadership Program, attendance at two of the three events in this summit can be the equivalent of a make up session for the Interpersonal Leadership Track and the Preventing Violence/Primary Prevention track. The goal of the Senate in this endeavor is to create a leadership summit that will include multiple speakers and inspire leaders from different groups/organizations on our campus to come together and develop leadership skills as a collective unit.